Your office is incomplete without a generous supply of monthly calendars, organizers, planners and pad holders. 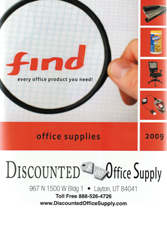 Whether you’re shopping for yourself or stocking up for the entire office, Discounted Office Supply.com prides itself in offering great pricing, a huge selection and superior service. In addition to the monthly calendars and appointment books you need to stock your office, we also have a large selection of briefcases for yourself or your staff. We carry business briefcases, ringed portfolios, student cases, travel bags and more. We serve the continental United States through our 36 geographically placed distribution centers. Every order placed before 1:00 PM local time is shipped same day and should arrive to you the very next business day.